Gary Giraffe is so excited to finally turn six--now he should be able to reach the acacia leaves all on his own When things don't go exactly as he'd planned, Gary is distraught. He tries and tries to get to the leaves himself, but he's just not tall enough. 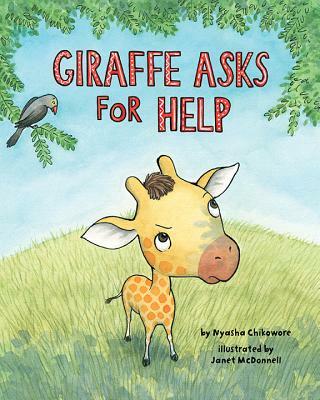 The other giraffes can do it--why can't he? Gary doesn't want to have to ask for help, but his friends convince him that everyone needs help sometimes. And that's OK Includes a Note to Parents & Caregivers with more information on help-seeking and independence in children. Nyasha Chikowore was a licensed clinical professional counselor who provided classroom and school-wide prevention activities related to mental health, with an emphasis on destigmatizing asking for any type of help. She is currently working on her doctorate in clinical psychology. Nyasha lives in Maryland.Janet McDonnell is an illustrator, whose work combines traditional media and digital magic, an author who has written, books, games, and magazines, and a teacher of kids from pre to high school. She is an illustrator coordinator for the Society of Children's Book Writers and Illustrators and on the advisory board of Play for Peace. Janet lives near Chicago, Illinois. Visit janetmcdonnell.com.